This CD contains two genuine relaxation methods – a short and a long version. Swami Janakananda guides you into a deep relaxation of body and mind to a background of music and sounds of birds, animals and the elements. He uses the Tantric mantras and visual symbols to awaken and harmonize your innermost nature. Roop Verma, on sitar, is the first musician to record the chakras, ancient music symbols. Comes with a 20 page booklet. Extra long playing time. Newly remastered version in Digipack. Produced in Sweden by the Scandinavian Yoga and Meditation School. 1. Experience The Wholeness of Your Nature; achieve deep relaxation (Yoga Nidra) to the sounds of Mother Earth. 2. Travel through the Space of Experience, a short piece of music composed and played on Svarmandal harp by Roop Verma. 3. Discover your Self. 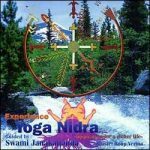 The Deep Yoga Nidra. An extraordinary work by Roop Verma and Swami Janakananda.